I have been blessed with thin flat straight hair all my life. I love it being naturally straight but I do not like the less volume hair I have. Even worst, my daily hair fall. Not helping at all. This has been my long time concern but I just didn't bother to do anything to fix it. Plain lazy! 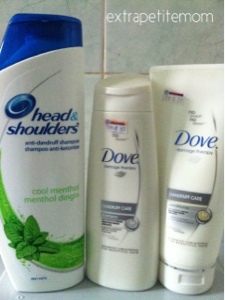 I have only been using Head & Shoulder shampoo every other day for the last few years. I tried using Sunsilk but it made top of my hair oily. Now why is that? I also did not use hair conditioner because my hair stylist told me that I have a thin hair and I should not use any conditioner as that will makes it even thinner! Of course I do not want that to happen so I stopped using it. I'm curious! (and a little bit nosy :P) How often do you wash your hair? Do you use conditioner every time after you wash your hair? Since we usually use a head scarf, which type of shampoo do you use? Do you rotate between two shampoos? P/S: You can read vivawoman.net for more informative and interesting topics discussed and products review on haircare. I'm looking for volumizing shampoo too as a treatment shampoo. I only saw Follow Me Green Tea di Giant. Don't know if its ok or not. Guess what, so far I think 'volumizing' shampoo is just a hoax hehe. Try doing cream bath every 2-weeks and a frequent hair treatment too. Bebelanja pulang but its worth it. That's what I did before and my hair at THAT time healthy as in inda karing, and macam tabal. But when I stopped doing those, back to the norm au naturale haha. I dont wear headscarf everyday since Im only at home but during weekends usually everyday psl I go out usually. Hehe.. I guess you are right about it. We wear headscarf hence our hair become more oily and etc being trapped all day long. A good shampoo with scalp care should be enough I supposed. Tip frm me would be applying ur shampoo twice as in.. apply, rinse n apply then final rinse.. insya-Allah~ i wear headscarf everyday n i just need to shampoo my hair ard 2-3x a week. Fr me hair mask works much better rather than conditioner... oh there's hairfall shampoo by sunsilk or pantene if ure willing to try..
Shall try this tip too ;p thanks Mrs.A. Also Ef, so far L'oreal works wonder with me hehe. Hope it'll work with you too. And don't buy those shampoo yang printed with thai's writing. I have tried the tip and my hair feels amazingly clean and thick! I am not sure if its the shampoo or the double cleanse but Im so glad it works!!! :D Thank youuuuu! auuuu no no to thai writings... well, I just don't buy them. hehehe... I sure hope it works for u Wiina, and Effa, im sure it's because of both!